Over the years, I’ve been saving questions often asked of me and I have compiled them here for this section of the website. Maybe you have a few questions of your own you’d like me to answer?! If so, please feel free to use the contact form on the contact page by clicking here. If your question wants more private attention, we can setup a confidential meeting, telephone conversation or videoconference. I’m excited to begin our dialogue! Dr. Nicki I live in Illinois and I cannot come to Hollywood for a session. Do you plan on offering online courses? Yes, actually we are in the final phase to launch online classes. You can browse the classes and learn more about the classes! Signup for our newsletter on the top of this page and we will notify you when the classes are available. Dr. Nicki, you look familiar, I swear I just saw you on TV. I cannot remember what show. Yes, I’ve been on many TV shows including Millionaire Matchmaker, Keeping Up with the Kardashians and Love Handles: Couples In Crisis among others. I work with reality shows that allows me to authentically apply my expertise. I am very proud of what you see on these shows as well as the opportunity they afford me to get my message out to the public. Dr. Nicki how long have you been a psychotherapist? I’m proud to say I’ve been in practice over twenty-five years. It has been a tremendous learning experience as I continue to discover each day the majesty of the human psyche. Dr. Nicki what is different between a therapist and a psychotherapist? Nothing really. The differences are between psychiatrists (medical doctors) and psychotherapist (non-medical practitioners). The differences you want to focus on when looking for a therapist is finding someone you feel connected to. Therapy is relationship and as such the “chemistry” needs to be right! Well, there’s a part of me that says everyone can use a good psychological mechanic, no matter what shape their engine is in! After all, who doesn’t want the most extraordinary life possible?! And for the most part we have terrible instruction or no instruction at all when it comes to how to successfully partner; how to parent; how to achieve great self-esteem; how to love yourself in a world that sometimes doesn’t love you; how to claim career success; how to find your career bliss etcetera. Good therapy can guide you to and through all of this. I have tried therapy before and it was not what I had expected nor did I have great results. What makes what you so different? That's a great question and I get it often. It's like going to a different hair salon or barber? Everyone has their own style. My style is very personalized and is tailored to fit your unique needs; however watching some videos of me in therapy sessions on TV shows will show you I’m the real deal (no I'm not acting nor are the people on the show; it's reality TV for real). Certainly I’m not for everyone. I’m straightforward, no-nonsense (though compassionate for sure) and want to offer real, tangible, life-affirming information. If you’re looking for someone to tell you your life is everyone else’s fault you won’t like working with me. On the other hand, if you want to claim your voice, your true power and have the life you’ve been asserting you want I might very well be your ticket to authentic change. 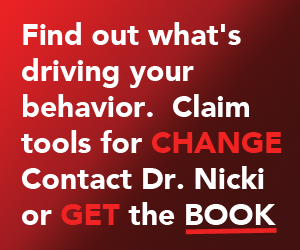 Dr. Nicki, do you do group seminars for large organizations or businesses? I see that your style would really work for my company and help us out tremendously. Yes, absolutely I do group seminars for any size organization or business (anywhere) including retreats. You are right that it works for businesses and helps companies through issues regardless of size or age of a company. I have been doing this for sometime and I work with charities, businesses and even do my own Live Events seminars and will be doing them quarterly, with my next Stuck No More Live Live event in Los Angeles. 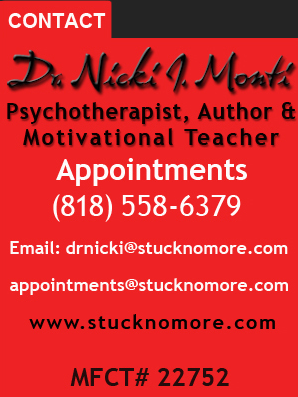 Be sure to subscribe to our newsletter and you will be informed of the next Stuck No More Live with Dr. Nicki J. Monti.